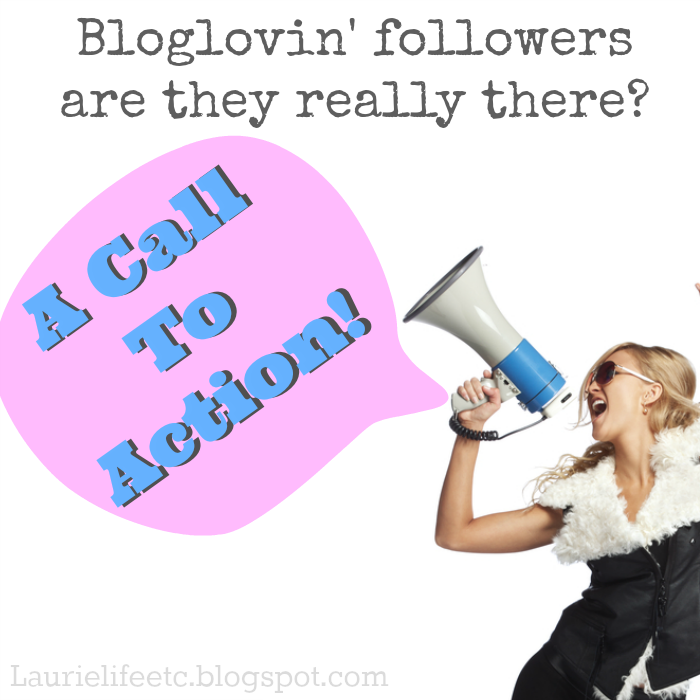 Laurie, life, etc...: Bloglovin' followers are they really there? A call to action! Bloglovin' followers are they really there? A call to action! I started this blog not long ago, the blog is new, but I am myself am not new to blogging, I been around for like two years now and I have learned a lot. I don't know why, but my following has always grown, I dunno if people are really interested in what I have to say, because this blog honestly had no niche, its mostly speaking my mind on what ever I feel needs to be said, so I am somewhat confused. My first blog Themakeupsquid.com grew in all areas, quickly too. I jumped on the Follow for follow band wagon and my Bloglovin' feed became a mess, mixed with follow for follows as well as blogs I actually read. So I decided to put the blogs I actually read in a section I call favs, these are personal bloggers I grew to know and love, we all kinda started at the same time. Blogging about anything has become so saturated today, so it can be hard to know if your followers are there for their own motives or are they truly interested in what you have to say. A call to action has become a known phrase among bloggers, it means that somewhere usually at the end of a post you ask your audience to answer a question, sign up for something or any other thing you would like them to do. I have been writing posts with no call to action anywhere in them and I noticed that the one post I did place a call to action in, I got a responce. Your readers want to interact with you, sure you may have a great post and people enjoy it, but if you leave them with nothing to do at the end, they are going to either click our of your blog or hop on to something else. Asking a question relevant to your post will engage your audience. Don't make this a general boring question, like "Which do you prefer?" or "How do you feel about such and such?" What the hell is that, I might as well write my own post. I really hate when I don't know where the question marks goes. talk to your audience like your talking to a friend or someone you just met, not a random person on the street, that's awkward and just weird. I am going to create a simple call to action follow button that I am going to place at the bottom of my posts, I am also going to make this the default signature on my blog, so that it is automatically there at the end of every post. Step 1. Get your button. You could make one yourself or get yours from bloglovin' itself. Go into your bloglovin' profile under the little blue heart icon, click down to the bloglovin button section, this will take you to a page that has button options for you, now you can get the button counter with the counter on there, but I am going to suggest the simple follow on bloglovin' button, why? Because I just feel its saying I am new to this and have no idea what I am doing, so come join my 55 followers, so no this isn't for me. You can change this at anytime once your numbers get into the three digits, it just looks better. Step 2. Copy your code. Once you have chosen the style you like, click the get code button and a pop up will appear with the code, now you can do the add widget thingy through blogger or whatever your using, but where I want to place this code, I am going to have to copy it, so right click that baby like you mean it. Step 3. Paste your code. I use blogger as my blogging platform, but I am sure the others has the same option or feature. Go into your post template and paste your code there. You can add a phrase or other links that you want to appear at the end of every post. This is a great and easy call to action and it has great results, enjoy. From March 15th - April 13th I gained 55 followers on Bloglovin'. Now just because I gained these followers, that doesn't mean they are actually reading my posts. My page views for all time since I started this blog are at 390. My best post is My Personal Disclaimer, with 33 views. I don't think this is bad for less than 30 days. Do you think bloglovin' actually helps your blog grow?